Game 12 was a draw, although it wasn’t a boring draw I think. Anand’s positional pawn sac was met with a positional double-pawn sac to equalize – in fact, most everybody seemed to like Black’s position in the pawn-down endgame more. Anand again had a sizable time advantage when he offered the draw with 22.Bxe7, but like in game 11, I just don’t see what his plan to continue the game would be. He’s got weak pawns on a2 (because of the …a4 lever), d3, and h4 and Black’s rooks are the more active set. And so the classical portion of the match ends in a 6-6 tie! This has happened before but all-but-one of the previous cases saw the sitting champion retain his title. In 2006, though, Kramnik beat Topalov in the rapid-chess tiebreaks 2.5-1.5. Anand holds a huge career advantage over Gelfand in rapids – 8 wins, against 1 loss and 19 draws. Still, I don’t think this will be quite as much of a cakewalk as that would suggest. Opening preparation and nerves will be a bigger factor here than in a lot of those rapid games (from Melody Amber tournaments, etc), and thus far and more recently, I’d say Gelfand has had the edge in both areas. Gelfand has his openings in order, whereas Anand has more fundamental decisions to make as to what openings to play as white and black. One good thing about Anand’s play since his win in game 8 is that he’s been generally playing more quickly in the last 4 games. Game 11 was a draw, so that leaves one regular game for all the marbles tomorrow. If that one is a draw as well, they go to tiebreaks (4 games of G/25 + 10 sec/move, I believe). And if it’s still tied, they’ll end all the fun with an Armageddon game. Well, after 6 psychologically interesting draws, the match veered off into strange territory starting on game 7. Anand played pretty poorly while Gelfand played quite well and won. Then in game 8, Gelfand lost in just 17 moves. After that, two draws, one where Gelfand was pressing (as white) and one where Gelfand’s opening novelty (as black) largely equalized on the spot. About game 8, I was wondering if Gelfand would go the Kasparov route and adopt what Yermolinsky has called a “++” attitude. By that I mean, push harder when you sense any weakness in your opponent. It’s why after 8 straight draws, an Anand win, followed by a spectacular Kasparov win, Kasparov turned to the Dragon in game 11. The idea was that the only challenging lines were to enter a super-sharp Yugoslav Attack, but that he sensed that Anand would be reluctant to do so after falling victim to some amazing preparation in the previous game. And as he expected, Anand didn’t attempt to put any pressure on Black and quickly found himself worse and then lost. Well, we have our first decisive game. The two players went into the 5…a6 Semi-Slav again, and Gelfand deviated with the expected 6.c5. 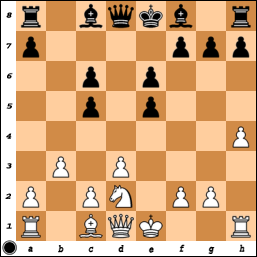 But Anand didn’t lose because of the opening (even though 10…c4 looks like a faster equalizer to me than 10…cxd4). He lost because he just played the middlegame poorly. I’m not sure he would avoided this result today even if he had switched openings. Gelfand is now up 1 with 5 to play – can Anand break through with White? I think the idea that Anand was playing himself into form can be discounted now, but the gloves have to come off unless he wants to go down without a fight like Kasparov did in 2000. I had to put Classical in parentheses because if the current drawing rate holds up, the match will go on for more than just 12 games. Lots of people have opined on the state of the match, so I’ll throw my 2 cents onto the pile too. Have I found the match exciting? No. Have I found the match interesting? Yes. It’s interesting for me to see how matches develop, what strategies the players are generally choosing, what openings they’re selecting, etc. In this case, Gelfand’s choices of the Grunfeld and Sveshnikov look inspired to me. They fit his opening style quite well in that both are extremely concrete. Still, I never would’ve guessed that he’d play them. It’s no real surprise to me that Anand hasn’t found much with 1.d4 – his results with that have never been as good, his World Championship win against Kramnik notwithstanding, and it’s a reminder that he’s really been a 1.e4 player for 90% of his career. In the first Sveshnikov, I don’t think he wanted to take any chances – I do expect him to probe there some more, there are a couple recent lines I saw today that might be fruitful. Before the match, I thought his move order progression would go 1.d4 –> 1.c4 (1 game at most) –> 1.e4, but given Gelfand has prepared the Sicilian for the match, I’m less certain about 1.c4 popping up now. The 2012 World Championship match between Anand and Gelfand begins tomorrow. I’m really looking forward to this match, and it’s probably the most anticipated event for me since the Candidates Matches that saw Gelfand emerge as the winner. 1. First, one from the match website itself – link. It provides an annotated history of their encounters, starting with Gelfand’s early wins and then the tides slowly turning followed by a longer period with some Anand wins and a number of draws. This is old news, but I somehow never got around to writing about this. Back in January, the Northern California Invitational took place in Fremont, CA. I was away in India at the time, but I had agreed beforehand to be the judge for the Best Game prize (the winner would receive a brand new iPad!). When I got back, Arun Sharma (the tournament organizer) had a file of all the games ready. I started looking through the games the following day (Friday, Jan 13th) and I was supposed to email him with my decision by the end of the weekend. I had never judged a best game competition before, but I didn’t think it would be especially difficult. In previous years with this tournament (when it was normally held in Berkeley), there were usually a handful of well-played, exciting games that really jumped out at me. Similarly, the USCL has long had Game of the Week (and Game of the Year) competitions; again, there always seemed to be obviously interesting games to choose from.